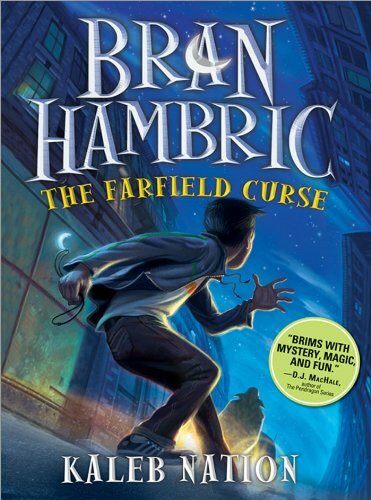 Kaleb Nation, the 20-year-old author of Bran Hambric: Farfield Curse, began writing this book at the age of 14. After spending four years rewriting the book, Kaleb has produced an energetic and exciting first novel. The prologue sets an eerie and suspenseful pace that reads like the scene from a good movie. Bran’s mother dies protecting him from a mage, and manages to transport him safely to a locked vault within a bank and completely clear his memory. Fast forward 8 years and the story takes off. gnome — anyone who is found to be a mage or a gnome is sent to jail. After a burglary which leads to an encounter with a creature that will have your hair raising, Bran begins to learn about his past. Little-by-little, Bran’s tale unravels consistently, like a good mystery should. Kaleb’s characters are all very unique, but it is certainly the well developed persona’s of the kooky Wilomas family that add flavor to this creative book. His writing also offers up vivid mental imagery and, at times, emotional power. Where truth and discovery meet, magic happens! A sinisterly, good read. Publisher’s synopsis: In a bustling metropolis where magic is outlawed, a six-year-old child is found inside a locked bank vault. A scrap of paper reveals his name: Bran Hambric. The child remembers nothing of his life before the vault. Only magic could have done this. But why would any mage risk breaking the law to place a child in a bank vault? About the Author: On the third night of the third month in 2003, 14-year-old Kaleb Nation had a sudden idea that began the story of Bran Hambric, a novel that would take most of his teenage years to write. Kaleb hosted his first radio show in Texas at age thirteen, and has since launched several websites, including kalebnation.com and TwilightGuy.com. Aside from writing, Kaleb enjoys creating music and blogging. A home-school graduate and a former black belt in taekwondo, he currently attends college in Texas and turned 20 in 2008. Visit: www.KalebNation.com, www.Youtube.com/KalebNation, and www.Twitter.com/KalebNation. Giveaway: Win a Bran Hambric Half Moon Necklace & exclusive Kaleb Nation event invite! Any person who posts links to the book’s pages on Amazon.com, the Barnes & Noble website and the Borders website on their social networking accounts (ex: Facebook, Myspace, Twitter, YouTube, blogs, etc), and posts a review of the book on each of the sites, will receive a Bran Hambric Half Moon Necklace and an exclusive invitation to a Blog TV event with Kaleb, where he will reveal secrets from the next book in the series! Links and reviews must be posted and emailed to branhambric@sourcebooks.com September 9 through 30. Please include full name & mailing address in the email.